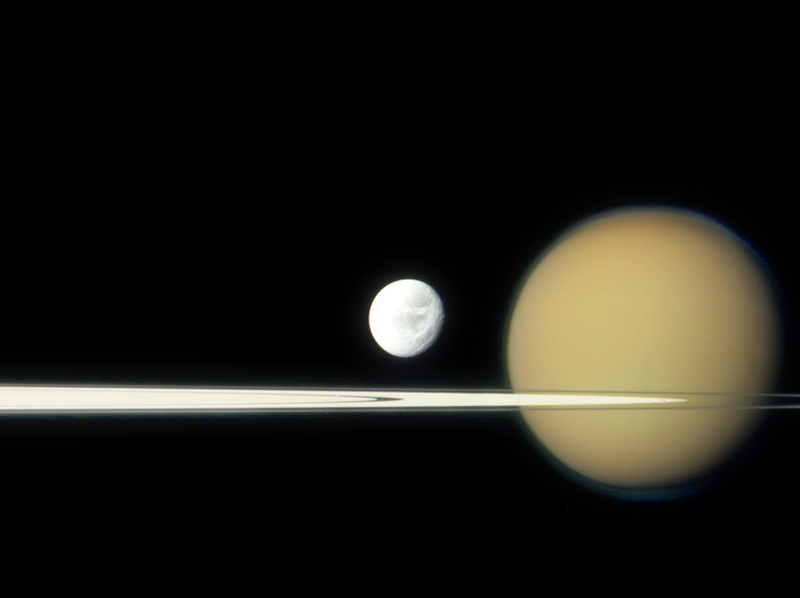 Saturn’s moons Dione and Titan lined up with the planet’s rings, seen here nearly edge-on, from the point of view of the Cassini spacecraft’s camera on September 17, 2011. This is a composite of three raw images taken with Cassini’s red, green and blue visible-light clear filters. Dione, 700 miles wide, is dwarfed by the much larger and further moon Titan, which is over 3,200 miles wide and wrapped in a thick opaque atmosphere. Also in this image is the 12-mile-wide shepherd moon Pan, barely visible within the Encke Gap in the A ring, just below and to the left of Dione. Cassini was about 1.33 million miles away from Dione when this view was acquired. Credit: NASA / JPL / SSI. Edited by Jason Major. See more scenes from Saturn on the Cassini Imaging Team’s website. What a stunning image, I can never get enough of Saturn, its rings, or its moons! Why did they move Dione? Compare it with the raw image, and they moved Dione about one moon-width closer to Titan.